The mission of BRUU’s adult religious education program (also known as Adult Life Enrichment, or ALE) is to offer our adult Members and Friends a wide variety of courses, seminars, workshops, and discussion groups in which they can broaden their understanding of life and living, as reflected in the 7 UU Principles (see below). We hope you will find many offerings that speak to your own spiritual quest so that you may grow in your knowledge of Truth as you define it. If you wish to attend one or more of the courses below, please consult the end of this catalog for directions on how to register. The ALE Committee publishes the Adult A.L.E. catalog three times a year: fall, winter, and spring. The educational opportunities are coordinated by volunteers and taught by volunteers. We invite anyone who is interested in fostering development of adult courses to propose a course of their own. Contact any member of our committee, or read Guidelines for ALE Instructors where you will find our convenient online tool to propose courses. You may also want to consider joining the ALE Committee. Contact our committee chair at re.adult@bruu.org. Recognize the inherent worth and dignity of every person. Observe justice, equity and compassion in human relations. Accept one another and encourage spiritual growth in our congregations. Pursue a free and responsible search for truth and meaning. Respect the right of conscience and the use of the democratic process within our congregation and society. Build a world community of peace, liberty, and justice for all. Unitarian Universalism is grounded in the understanding that our actions speak louder than our words or beliefs. Faithful living for us includes discerning the course of action that best reflects our beliefs and values and then acting or choosing accordingly. As inheritors of a faith tradition that honors a wide variety of sources of religious understanding and authority, our big questions are: How do we discern the moral course of action in a particular circumstance? To what source(s) of authority do we turn for help: personal experience, community wisdom, conscience, religious texts, the words and deeds of prophetic people, reason, science, God? 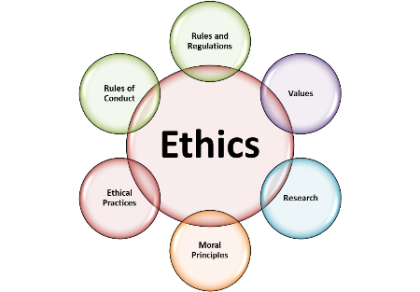 If we are intentional in developing a personal ethical framework to live by, then the behavioral choices we make and the actions we do or do not take can reflect our most deeply held values. Join Kristin and Kelly for this interactive one day workshop. Come join your BRUU friends for this year’s #1 movie: Green Book – Oscars for Best Picture, Best Supporting Actor, Best Screenplay. This is the real-life story of an unlikely friendship between a Bronx Italian tough guy Tony Lipp and a virtuoso Black pianist Dr. Don Shirley on concert tour through the Deep South in 1962. Their friendship proves, once again, that if people of different races come to know each other personally, discrimination goes away. But if we act only on cultural values, well, the setting is the 1960’s . . . need we say more? Yes, let’s say more. Thoughtful discussion after the movie. Reservation REQUIRED. Maximum of 8 seats available, So FCFS. We’ll be watching this movie on large-screen in the Sobrio’s family room. Earth’s atmosphere is a scary place, with dangerous violent thunderstorms, lightning, tornadoes, hurricanes, microbursts, and more. How do these frightening storms form? Why is Florida the storm capital of America? How does lightning form? What is a tornado? What is “Tornado Alley” in the Midwest and why do so many killer tornadoes form there? America is beset with monstrous hurricanes, and their frequency is getting worse. What causes a hurricane? How does the dry Sahara desert play a role? Why do hurricanes all drift west in the beginning, then turn east and head out into the Atlantic as they mature? How big can one get? Join Frank Gregorio for a 2-hour lesson (with intermission) on the violent storms of Earth. What you learn will “blow you away”! Robert Frost’s life spanned a remarkable period of progress in science and technology. He was a teenager when the speed of light was determined; a young man when relativity was proposed; middle-aged when penicillin was discovered and was elderly when the structure of DNA was solved. Not only did Frost live through these discoveries, but he strove to comprehend and internalize them in a way that few writers or poets of his time did. Frost’s interests were broad, extending from biology to cosmology and from the microscopic to the universal. Delving into advanced topics such as quantum mechanics and cosmology, Frost’s poetry is brimming with allusions to science, many of them quite sophisticated and subtle. And while Robert Frost’s conflict with the implications of modern science has been thoroughly explored and well-described by other writers and literary critics. Virginia Smith, a Professor of Chemistry at the Naval Academy in Maryland, wrote a fascinating book in 2018 outlining Frost’s use of scientific language and imagery to expand his artist’s palette. Thanks to the efforts of Rev. Charlotte Lehmann, Dr. Smith has agreed to visit BRUU in person and discuss her book and Robert Frosts’ poems with us. Why does the UU church in the Hampton Roads area have to plan its activities around recurring nuisance flooding? Why is sunny day flooding becoming a common occurrence all along the eastern seaboard? Why are extreme weather events becoming more and more common everywhere? Could the answers be found in what’s happening in the polar regions? Dr. Larry Underwood, who lived in Alaska for 25 years and did extensive research in the Arctic, shows us how climate change is to blame. Reasons are complex and fascinating. Come hear how melting permafrost, melting pack ice, and melting glaciers will affect everyone in Virginia and everywhere else. And come learn how we, individually and collectively, can avoid the worst of these affects. Just what the H… should I eat? As we age, our health begins to face more and more onslaughts from day to day living, toxins in the food we eat, our sedentary existence, bad genes, over-indulging and obesity, high-gluten diets, declines in body performance, new pathogens, diseases of aging, and threats that will face us whether we acknowledge them or not. Whew! Sometimes, however, we can do something about it. Nutrition is one of those things. Just what are the latest facts, myths and contradictions about carbs, fats, proteins, gluten, added sugar, GMO’s, fiber, alcohol, keto diets, processed foods, caffeine, artificial sweeteners … AGH! The truth is out there! 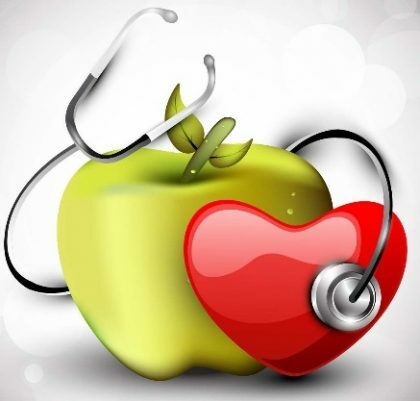 Join Trevor Lomax, whose internship toward his Masters degree in Nutrition Coaching is cutting-edge, for a one-day lesson on new insights into the nutrition of a healthier life. You’ll be glad you did. Bring notebook and pen to take notes. Translated into 24 languages, ACIM is studied around the world and by thousands of Unitarian Universalists. ACIM’s foundational teachings dovetail with all 7 UU principles and offer an additional path to appreciating their significance. New to ACIM? Join our introductory group to learn about the principle teachings of ACIM. Discover a different way to think about time and space, one that challenges commonly held perceptions and brings peaceful fullness to life. Call to see if this study is for you. 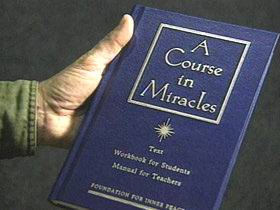 Already familiar with ACIM? Join us for a closer look at the magnificent teachings of A Course in Miracles and benefit from the rich discussion of experienced students. Bluebells are some of the most beautiful flowers in VA. When they bloom, the forest floor comes alive with lavender color. The Prince William Conservation Alliance helps operate a public farm nearby, which is fortunate to have large fields of bluebells. 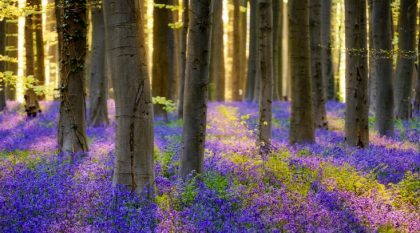 Each year, they hold the Bluebell Festival, inviting the public to come to the farm and listen to a host of speakers educate us about nature, the Merrimac farm, and bluebells. 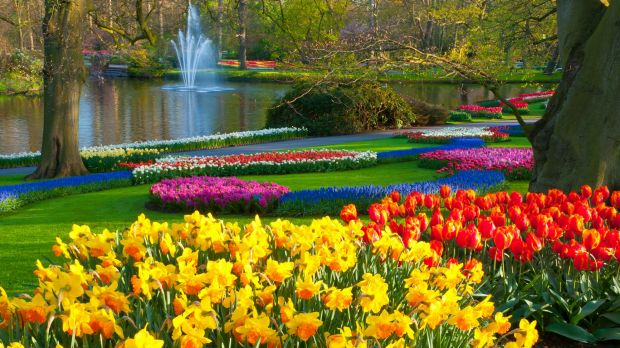 Speakers take the public through easy, short trails through the flowers every 30 minutes. This year, the festival will be held on Sunday, April 14. Our own Charlie Grymes will be one of the featured naturalists and discuss the history of Merrimac Farm. He and we invite you talk a gentle walk through the bluebells. 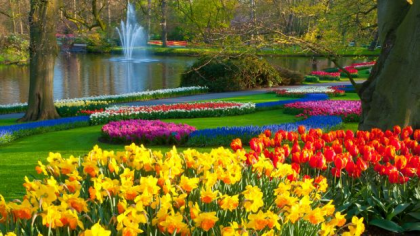 Climate Change has accelerated the blooming of the flowers. If April 14 becomes too late and the flowers are already past peak bloom, then we will notify registrants and schedule an earlier walk through the farm. Understanding and accepting this fact leads to living in peace. Yet in our competitive culture, perfection is the standard against which we are judged at work, in school, in sports, in the arts, and likely in our home life. It’s a self-defeating standard. We humans are always becoming, not arrived. This 3-session class will explore more deeply through group discussion the topic of Rev. Charlotte’s sermon “The Spirituality of Imperfection”. We will use a book of the same name as a basis for exploration. Participants will need buy the The Spirituality of Imperfection book. Inexpensive used copies are available from Amazon. Like what you see? It’s time to REGISTER! As a courtesy to the instructor, yes. That way (s)he knows the class has attracted the minimum number of participants desired for conducting the class. What if I’m not sure I can make it? Register anyway. You can always contact the class Instructor before the class begins. Meanwhile, the class can go forward because the minimum number of signups has been met. Is it okay to just drop into a class at last minute? Sure. Just give the instructor a courtesy call or email. We prefer that you register online, since it is easy and facilitates notification to instructors of your intent to attend. Frank Gregorio is a retired Science teacher for Prince William County Schools. With degrees in Earth Science and Biology and 35 years of experience as a practicing teacher, CEO and corporate scientist of an international biotech company, and a government scientific investigator for FDA, Frank is well prepared to share his scientific knowledge with us. He also operates a very popular educational YouTube channel with over 46,000 subscribers (https://www.youtube.com/user/sfgregs). Marti Giese’s career includes teaching special needs children, counseling domestic violence victims, and providing chaplaincy to senior adults and hospice patients. Her education includes an M.Div. in pastoral counseling and metaphysical/ esoteric wisdom teachings, and an M.A. in Human Resources with a focus on adult education. Marti’s avocation is Blossomforth, a spiritual community where seekers unite to participate in discussions focusing on spiritual growth techniques that enable participants to step into the power of self-healing. Kristin Worthington is the Director of Religious Education at the Bull Run Unitarian Universalist Congregation in Manassas, Virginia. Kelly Maitland has spent 34 years as a public school teacher, mainly working with students with special education goals. She has taught many subjects at all levels from pre-K to adults and is currently a transition specialist at a local high school. Dr. Larry Underwood has been an environmentalist most of his adult life. He lived in Alaska for 25 years where he conducted research in cold adaptation and Arctic ecology. He has also taught Biology at the University of Connecticut, the University of Alaska, NOVA, and George Mason University. Recently, he became the Citizen’s Climate Lobby’s Liaison to U.S. Rep. Barbara Comstock. Kathy Sobrio describes her long work life as a crazy-quilt of adventures that took her from Capitol Hill, the VA legislature, and association work to Manassas City’s Osbourn High School teaching senior-year English. Her attitude toward “teaching” is that people learn the most when they and their classmates can discover new insights through purposeful activity and discussion. She is the ideal facilitator for a provocative film such as Green Book. Charlie Grymes was a founding member of the Prince William Conservation Alliance (www.pwconserve.org) in 2002, which focuses on watershed protection, conservation of natural areas, and smart growth in a rapidly-suburbanizing county. He spent 32 years with the US Department of the Interior, but is a recovering bureaucrat now. He teaches the “Geography of Virginia” class (www.virginiaplaces.org) occasionally at George Mason University. Trevor Lomax earned a BS in Dietetics from James Madison University and will be completing his Masters degree this May from Florida State. He was a summer intern at the University of Wisconsin athletic department for sports nutrition. He was awarded personal trainer of the year at JMU’s University Recreation Center. He currently offers on-line coaching for workout programs and personalized nutrition plans. Dr. Virginia Smith was raised in an Air Force family. She earned an A.B. in chemistry and physics from Mount Holyoke College, a Ph.D. in biochemistry from Washington State University, and held a postdoctoral fellowship at Penn State University before joining the faculty of the U. S. Naval Academy, where she taught Chemistry since 2000. She served as an Air Force officer in the U.S. and in Korea; she also worked in industry in Sacramento and Seattle. She maintains active scholarly research projects in protein biochemistry, historical epidemiology, and science in poetry. Virginia recently published a book, A Scientific Companion to Robert Frost, that describes the allusions to science, nature, and technology in his work. Rev. Charlotte Lehmann is BRUU’s settled minister. She is a life-long UU. Her mother remembers when Robert Frost visited Mt. Holyoke College and read his poetry. Prior to ministry, Rev. Charlotte managed environmental geochemistry laboratories at colleges and universities; she still considers herself a geologist. The natural world is a source of nurture and inspiration to her.